Socrates is open 365 days a year from 9AM – sundown. Admission to the Park’s grounds, exhibitions, and programs is FREE. The Park’s address is 32-01 Vernon Boulevard / Long Island City, NY 11106. Our main entrance is located at the intersection of Vernon Boulevard and Broadway. You can also enter through the gate at the north end of the Park on Vernon Boulevard. Our Beach at Hallets Cove is located at 31-10 Vernon Boulevard. You can only access the beach from Vernon Boulevard. Take the N/W train to the Broadway station* in Queens and walk eight blocks west on Broadway (toward the East River) to the intersection of Vernon Boulevard. *The newly renovated Broadway station is now open! Check the MTA’s website for updates on train service. Take the Q103 or Q104 to Broadway and Vernon Boulevard. Take the Q69 or Q100X to Broadway and 21st Street. Check the MTA’s website for updates on bus service. NYC Ferry by Hornblower service extends to Astoria Landing, located about a five minute walk north of the Park. There is no parking available on-site at Socrates with the exception of one handicap designated spot outside the main gate at the intersection of Vernon Blvd and Broadway. School buses and tour buses are permitted to pull into the Park through our main gate with advance approval. 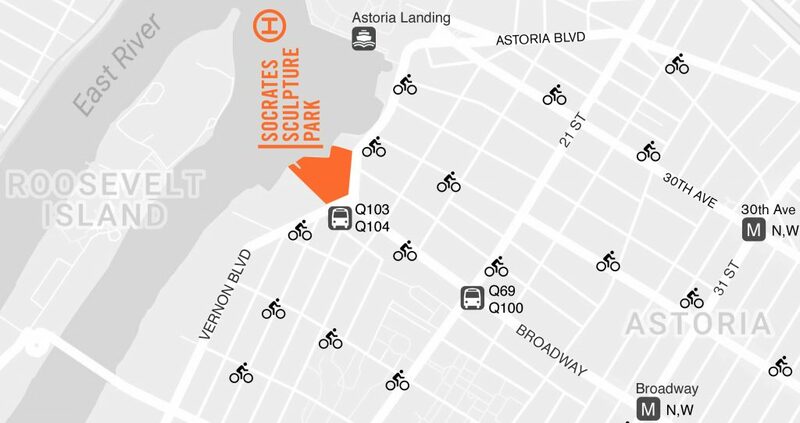 Please call 718.956.1919 or email info@socratessculpturepark.org to request permission. Street parking is available in the neighborhood around the Park. Take the upper level, exit at 21st Street. Turn right onto 21st Street and continue approximately one mile and make a left on Broadway. Continue to the intersection of Vernon Boulevard and Broadway. Stay right as you exit the tunnel and take Exit 14: “21st St./Long Island City”. Follow 21st St. and make a left at the fourth traffic light, 46th Ave. Go two blocks and make a right onto Vernon Blvd. Follow Vernon Boulevard for approximately a mile and a half to the intersection of Broadway. Take Exit 15 “Van Dam St.” (This is the last exit before the tollbooth for the Midtown Tunnel). Make a right at the 1st light, Van Dam St. Go one block and then make a left onto Hunter’s Point Ave. Proceed along Hunter’s Point Avenue and make a right onto 21st St. Follow 21st St. to 46th Ave and make a left. Go two blocks and make a right onto Vernon Blvd. Follow Vernon Boulevard for approximately a mile and a half to the intersection of Broadway. Take the McGuiness Avenue exit. At the bottom of the exit ramp make a left onto McGuiness Avenue North. Continue on McGuiness Avenue across the Pulaski Bridge. As you come off the bridge, go straight onto 11th Street for five blocks to 46th Ave and make a left. Go one block to Vernon Boulevard and make a right. Follow Vernon Boulevard for approximately one and a half miles to the intersection of Broadway. Exit at the Long Island Expressway Westbound. Continue to Exit 15: “Van Dam St.”, the last exit before the tollbooth for the Midtown Tunnel. Make a right at the 1st light, Van Dam St. Go one block and then make a left onto Hunter’s Point Ave. Continue along Hunter’s Point Avenue and make a right onto 21st St. Follow 21st St. to 46th Ave and make a left. Go two blocks and make a right onto Vernon Blvd. Follow Vernon Boulevard for approximately a mile and a half to the intersection of Broadway.